The first-ever study to map U.S. wild bees suggests they are disappearing in the country's most important farmlands -- from California's Central Valley to the Midwest's corn belt and the Mississippi River valley. If wild bee declines continue, it could hurt U.S. crop production and farmers' costs, said Taylor Ricketts, a conservation ecologist at the University of Vermont, at the American Association for the Advancement of Science (AAAS) annual meeting panel, Plan Bee: Pollinators, Food Production and U.S. Policy on Feb. 19. "This study provides the first national picture of wild bees and their impacts on pollination," said Ricketts, Director of UVM's Gund Institute for Ecological Economics, noting that each year $3 billion of the U.S. economy depends on pollination from native pollinators like wild bees. The first national study to map US wild bees suggests they're disappearing in many of the country's most important farmlands. Relatively low abundances are shown here in yellow; higher abundances in blue. "Wild bees are a precious natural resource we should celebrate and protect," said Ricketts, Gund Professor in UVM's Rubenstein School of Environment and Natural Resources. "If managed with care, they can help us continue to produce billions of dollars in agricultural income and a wonderful diversity of nutritious food." These counties tend to be places that grow specialty crops -- like almonds, blueberries and apples -- that are highly dependent on pollinators. Or they are counties that grow less dependent crops -- like soybeans, canola and cotton -- in very large quantities. Of particular concern, some crops most dependent on pollinators -- including pumpkins, watermelons, pears, peaches, plums, apples and blueberries -- appeared to have the strongest pollination mismatch, growing in areas with dropping wild bee supply and increasing in pollination demand. Pesticides, climate change and diseases threaten wild bees -- but their decline may be caused by the conversion of bee habitat into cropland, the study suggests. 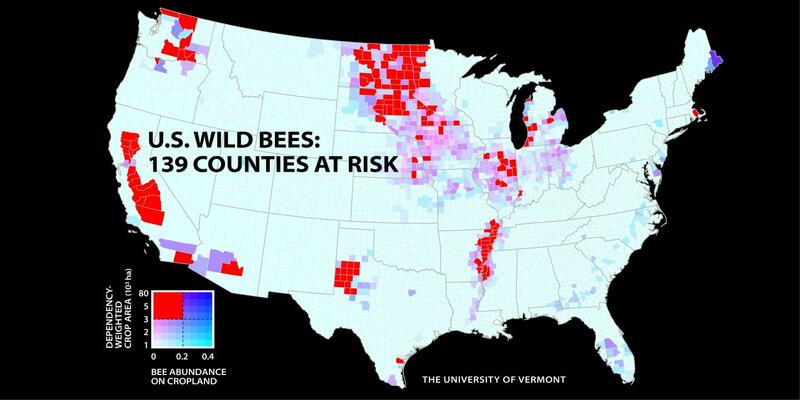 In 11 key states where the map shows bees in decline, the amount of land tilled to grow corn spiked by 200 percent in five years -- replacing grasslands and pastures that once supported bee populations. Over the last decade, honeybee keepers facing colony losses have struggled with rising demand for commercial pollination services, pushing up the cost of managed pollinators - and the importance of wild bees. A new study of wild bees identifies 139 counties in key agricultural regions of California, the Pacific Northwest, the Midwest, west Texas and the Mississippi River valley that face a worrisome mismatch between falling wild bee supply and rising crop pollination demand. 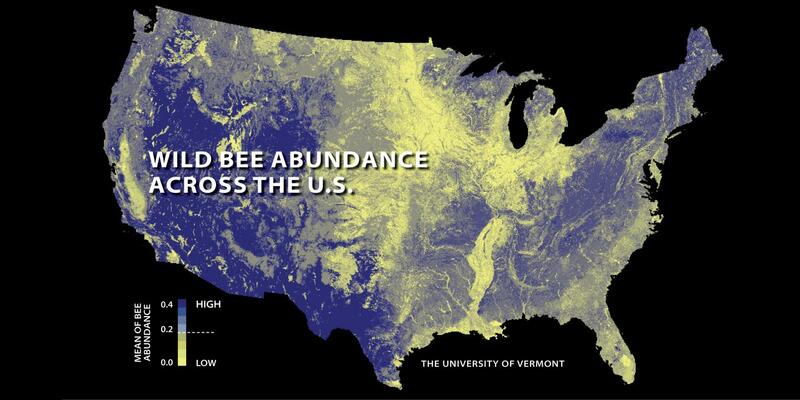 "Most people can think of one or two types of bee, but there are 4,000 species in the U.S. alone," said Insu Koh, a UVM postdoctoral researcher who co-hosted the AAAS panel and led the study. "When sufficient habitat exists, wild bees are already contributing the majority of pollination for some crops," Koh adds. "And even around managed pollinators, wild bees complement pollination in ways that can increase crop yields." A team of seven researchers -- from UVM, Franklin and Marshall College, University of California at Davis, and Michigan State University -- created the maps by first identifying 45 land-use types from two federal land databases, including croplands and natural habitats. Then they gathered detailed input from national and state bee experts about the suitability of each land-use type for providing wild bees with nesting and food resources. "The good news about bees," said Ricketts, "is now that we know where to focus conservation efforts, paired with all we know about what bees need, habitat-wise, there is hope for preserving wild bees."